Discover this spectacular destinationwith the most incisive and entertaining guidebook on the market. Whether youplan to sample fine wines in Hawke's Bay, canoealong the Whanganui River or hike across the Franz Josef glacier, TheRough Guide to New Zealand will show youthe ideal p... read full description below. Discover this spectacular destinationwith the most incisive and entertaining guidebook on the market. Whether youplan to sample fine wines in Hawke's Bay, canoealong the Whanganui River or hike across the Franz Josef glacier, TheRough Guide to New Zealand will show youthe ideal places to sleep, eat, drink, shop and visit along the way. Independent, trusted reviews written with Rough Guides' trademark blend of humour, honesty and insight, to help you get the most out of your visit, with options to suit every budget. Full-colour maps throughout - navigate New Zealand's towns and cities or its scenic coastal roads without needing to get online.- Stunning images - a rich collection of inspiring colour photography. - Things not to miss - Rough Guides' rundown of New Zealand's best sights and experiences. Itineraries - carefully planned routes to help you organize your trip. Detailed regional coverage - whether off the beaten track or in more mainstream tourist destinations, this travel guide has in-depth practical advice for every step of the way. Areascovered include: Auckland, Northland, Western NorthIsland, Central North Island, The Coromandel, Bay of Plenty and the East Cape, Poverty Bay, Hawke's Bay and the Waiarapa, Wellington, Marlborough, Nelson andKaikoura, Christchurch, Central South Island, Dunedin, Stewart Island, the WestCoast, Queenstown, Wanaka and Central Otago, Fiordland . Attractionsinclude: Milford Sound, Farewell Spit, KaikouraPeninsula, White Island, Ninety Mile Beach, East Cape, The Catlins. Abel TasmanNational Park, Wai-o-Tapu, wine regions. Basics - essential pre-departure practical information including getting there, local transport, accommodation, food and drink, health, the media, festivals, outdoor activities, culture and etiquette, and more. Background information - a Contexts chapter devoted to history and recommended books, plus a guide to Maori language and a glossary. 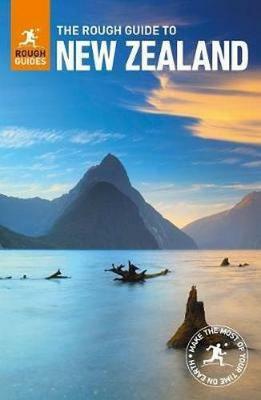 Make the Most of Your Time on Earth with The Rough Guide to New Zealand. About Rough Guides: Escapethe everyday with Rough Guides. We are a leading travel publisher known for our tell it like it is attitude, up-to-date content and great writing. Since1982, we've published books covering more than 120 destinations around theglobe, with an ever-growing series of ebooks, a range of beautiful, inspirational reference titles, and an award-winning website. We prideourselves on our accurate, honest and informed travel guides.